We’ve reviewed the Red Lion and the Clapton Hart only a few days ago, all run by the Antic group so it was only fair that we gave their E17 new kid, The Chequers a visit for Sunday lunch. We wrote about this pub on their opening night if you want to know a bit more. It’s slowly changing, a few more beers on tap, the staff are getting into their stride, the kitchen is ready, the garden has been cleared from being the dumping ground for all the stripped out junk. The coffee machine is still waiting to do it’s job – apparently they don’t have any coffee or cups yet. The women’s toilets need some work beyond the quick slap of paint and picture hanging as only one out of three was in working order. We booked for 1pm as we thought it would be packed. 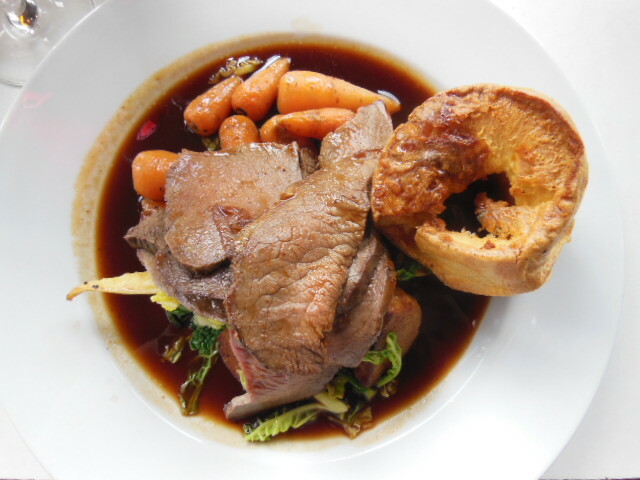 And it was – every table was full of the lovely people of E17 eager to try out the Sunday roasts. We were impressed that as well as the roasts there were two veggie options, plus two fish. The pork, beef and chicken are written up as coming from named farms but that really doesn’t tell you very much – there are good and bad farms, so I do want to find out more about the sourcing of ingredients from the chef. Those looking for the traditional spring lamb on Easter Sunday would have been disappointed – quite an oversight and may be an indication that the menu won’t be changing often. They also do half portions for kids. The kitchen conversation did intrude on the chatter in the pub, we were near the windows towards the front of the pub but could clearly hear the E17 equivalent of shouty Gordon. We laughed at shouts of ‘oh wake up Terence, please,’ ‘someone wants the squid’ and ‘where’s the polenta?’ – that’ll be our starters then! 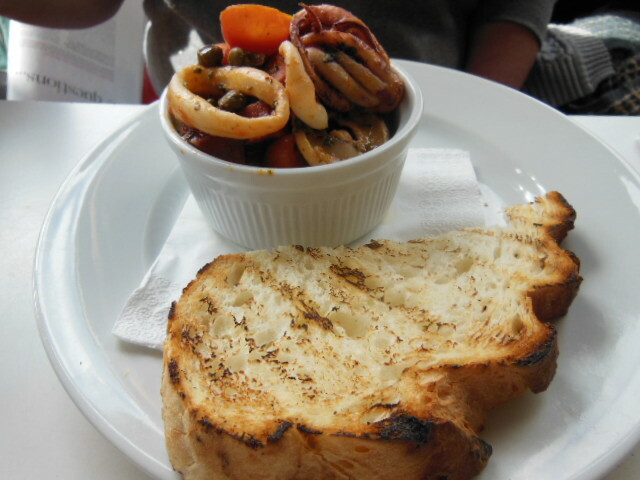 Plate-envy arose when the other Walthamstowfoodie’s polenta and creamy wild mushroom starter arrived with garlic toast, although my baby squid, chorizo, capers and cheery toms looked just as tempting. The balance of squid to chorizo swings heavily in favour of the pig. 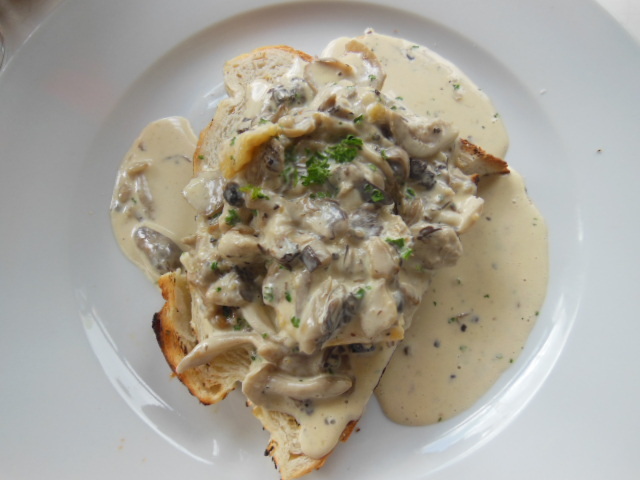 The wild mushroom dish was a cracker – full of flavour, at £5 each the starters were good value for the quality of the ingredients and portion size. Roast beef was the order of the day but there was no sign of it being served pink as promised, the red wine gravy was tasty but was drowning out the beef on the plate. Served with baby carrots, cabbage, roast parsnips and roast potatoes plus Yorkie, at £12 it isn’t cheap. Portions are very generous, the table next to us both had the half chicken and that was a hell of a big chicken! As roast beef demands red wine, we went for the Chilean Cab Sauvignon. With no room left for dessert, the cornflake ice cream and cheese board will have to wait for our next visit. And hopefully by then Terence will be having a better day! This entry was posted in Pubs, Restaurants in E17 and tagged Antic, Easter, Gastropub, Sunday roast, The Chequers E17, The Chequers pub. Bookmark the permalink. Hi Bill It is a great place, pleased we have it, the rose and crown and the bell as our locals.